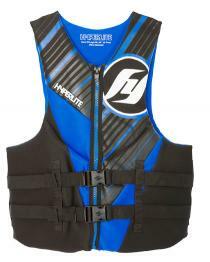 The Hyperlite TALL is the LARGEST all NEOPRENE life vest in the world for men 280lbs, 300lbs, 400lbs, and more. The TALL is BIG, Coast Guard Approved, and very comfortable for sizes 2XL-TALL, 3XL-TALL, 4XL-TALL, 5XL-TALL. The biggest size, 5XL-TALL (5XLT), will fit a chest size to 66 inches, but stretches a few inches bigger because of the stretch that is in Neoprene fabric. This oversized life jacket is 3 inches longer in the torso so it will cover the belly a little better and wont look like a crop top or a bra on tall men. 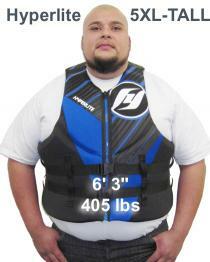 Plus sized women buy this life jacket too, since there just are not any womens vests that big. 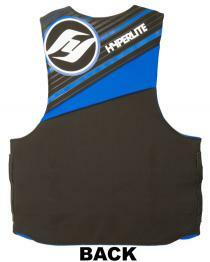 This Hyperlite TALL neo life vest has large armholes for freedom of movement. It has segmented that bend and flex. It is light and comfortable. Freedom of movement allows you to move, paddle, row, ride behind a boat in a towable tube, water ski on an Big Daddy waterski, ride a big wakesurfer, or ride a big jet ski. A big man who finds a comfortable safe life jacket for the first time will be able to enjoy many new activities in the water, such as calm water river rafting in the Sacramento Delta, boating on a lakes, rivers, marinas, or ocean bays, activities on Caribbean vacations, such as going on catamaran tours and looking great in a life jacket. If you are over 6 ft tall, we recommend a TALL life vest to give you more torso coverage. If you are short, you can find very big REGULAR LENGTH NYLON vests, but not NEOPRENE. (Please see related products). This life jacket can be a comfortable alternative to the 4XL/7XL Full Throttle Nylon Vest if you want the soft feel of NEOPRENE. Beware of ads for "BIG and TALL". Size stamp on inside of vest MUST say "Tall" or "3XLT" with the "T" for Tall. If it does not designate Tall on the size stamp, it is a regular length vest, NOT a Tall vest. See our posted a photo of a customer wearing the 4XL-TALL. He is 6'7" 350 lbs. 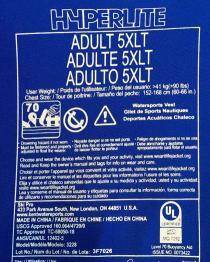 There is another picture of a man 405 lbs wearing the 5XL-TALL. (1) It runs a little BIG because of the stretch in Neoprene fabric, so the belts have a little extra contingency strap length so you can still buckle it up if you stretch it beyond 66". 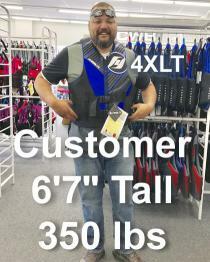 Hyperlite consulted with Water Ski World to design and test the 5XLT size to make sure it fit comfortably on the largest men. We publish the manufactures size charts but do not guarantee a fit based on those charts because every person has a different body shape. Buyer is responsible for return shipping if it does not fit. The possibility of a wearable product fitting your particular body shape is a risk everybody takes when buying online from any online store. Buyer is responsible for choice of size and waives all liability for his choice. A vest that is way too big and loose fitting on you is not safe. Exactly what I was looking for. Very comfortable. Feels good! Nice and lightweight, soft, and easy to adjust. The only advice I would give is get 1 size bigger than you are. I always wear 2XL but needed a 3XL with this vest. It's great that it covers my full upper body and doesn't feel like a kids vest or half vest.